...and if that driver is tweeting to us we literally have their thoughts beamed into our collective hivemind continuously. As such we can’t help but notice what bothers them. Furthermore, a bunch of us are EV drivers. And we tend to live a lot of the trials and tribulations of electric motoring, though we maintain there are (already) far more privileges and outright joys! Clearly these issues have no single fix. But bunching together some tools, we’ve launched a new concept to make these things easier for the EV driver. 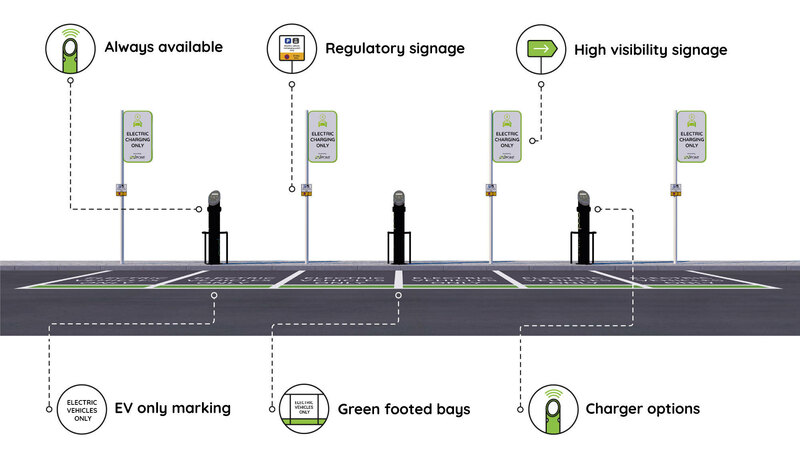 At least 6 Pod Points ( 6 Solos/ 3 Twins) must be installed to qualify as an EV Zone, that strong starting point makes it very likely drivers will arrive to find an available charger. That Pod Points prove to be easy to use and reliable is extremely important to us, and to that end we were buoyed by the results of last year’s ZapMap poll. Making it obvious which bays are for your electric car (and not for their ICE car!). The green strip has a great aesthetic effect without slathering the whole place in paint, unnecessarily. Again making the purpose of these bays clear, but also assisting way-finding once EVs have entered the car park, elevated signage is of great benefit. With the implication of legal weight, the formal signage is a more potent deterrent to ICEing and abuse. Using Pod Point’s smart “Array Charging” load balancing system, it is possible to fit up to three times as many charging points onto an existing supply, without the need for upgrades or de-rated chargepoint installations. Working with our hosts to consider things like bay enforcement and optimal positioning of Pod Points, while working with Array Charging (and potentially some “passive” infrastructure provision) makes scaling the provision in future simple. One of the first EV Zones deployed in the field is at Chester Zoo, and we’ve been delighted with both the utilisation level and the feedback, so far. Want to know more about EV Zones? Get more info or speak to our team.